The Chicago Cubs asserted their intentions to end the Billy Goat Curse last night with their 1-0 win over the San Francisco Giants, boosting their World Series expectancy to 35%. 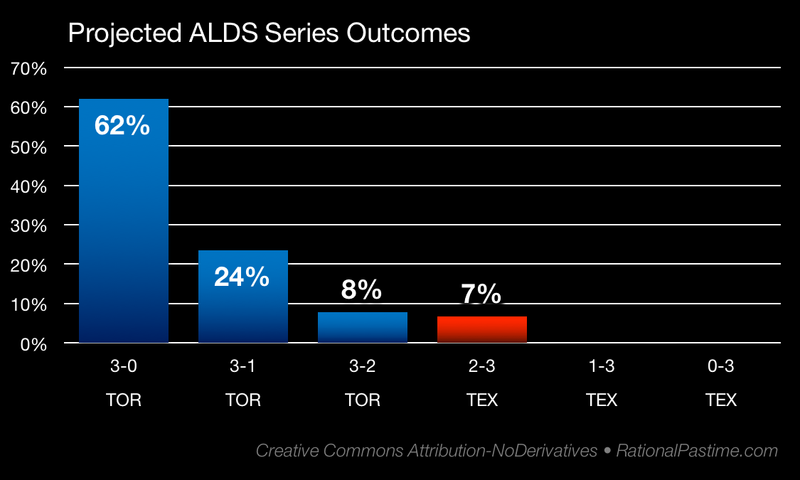 The Toronto Blue Jays continued their schooling of the overrated Texas Rangers, raising their championship probability to 23% and forcing their opponents' below 1%. The Cleveland Indians and Los Angeles Dodgers also improved against their respective opponents, the Boston Red Sox and Washington Nationals. 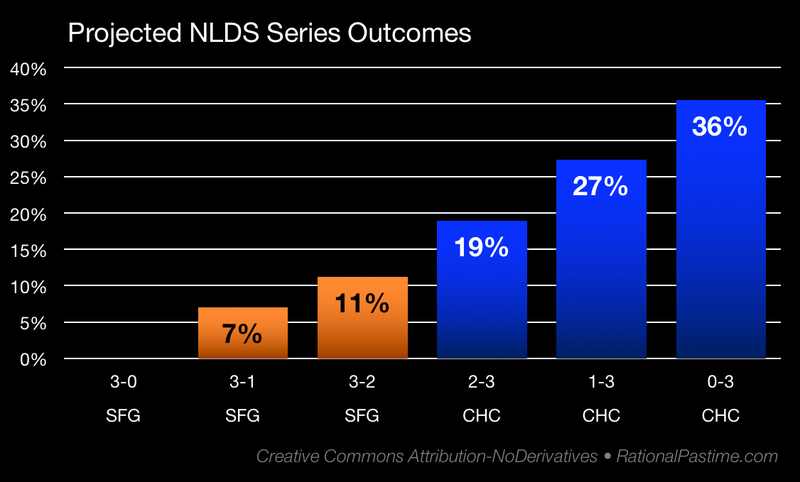 Thanks to Javy Baez's eighth inning solo shot, the Cubs improved their chances of advancing to the NLCS to a heady 82%, with a 36% chance of sweeping the Giants. San Francisco holds on to a 11% chance of forcing a fifth game and moving on. In another of many close contests so far in the 2016 MLB Postseason, the Los Angeles Dodgers held on in Washington against the higher-seeded Nationals. Clayton Kershaw & Co. enjoy a 68% chance of reaching the NLCS for the first time since 2013. If the Nationals can force a fifth game at home, they have a one-in-five chance of advancing past the first round of the playoffs for the first time in franchise history. Despite a far better performance in the second game of the ALDS, the Texas Rangers' prospects are grim. 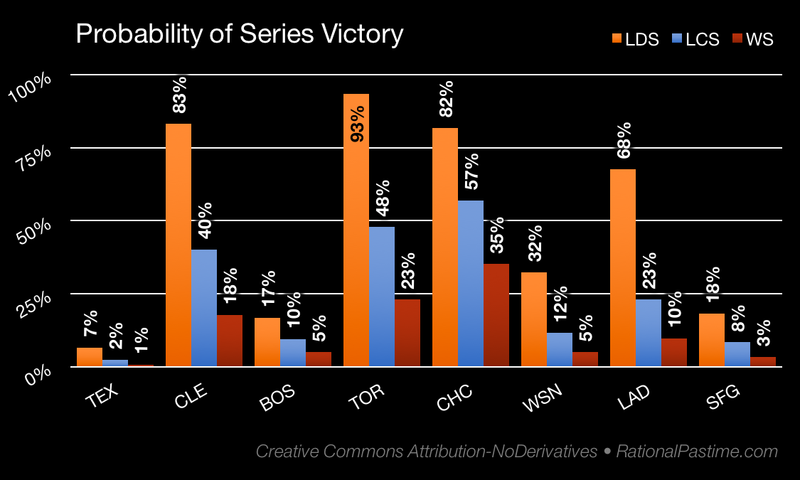 They must win-out to advance to the Championship Series, an outcome that my simulator assigns a measly 7% probability. That same simulator gives the Jays a 62% chance of finishing the Rangers off on Sunday. The Red Sox have struggled to find their footing in Cleveland, leaving them with only a 17% chance to win in five games. 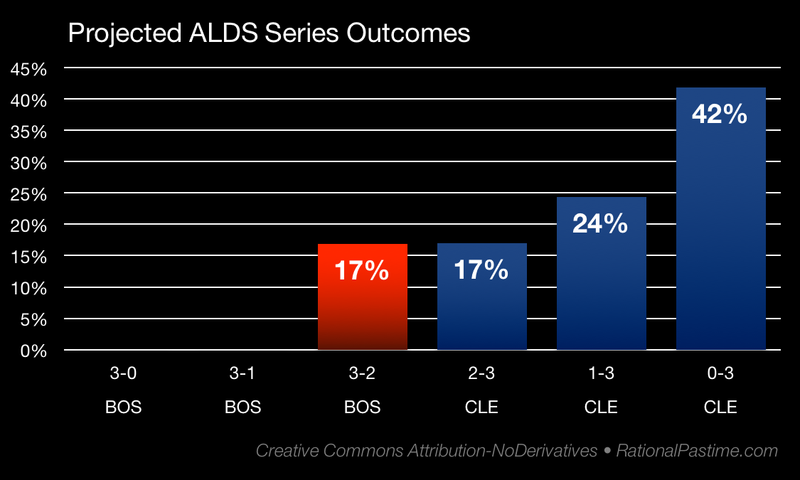 The Indians are 42% to finish off Boston in game three. 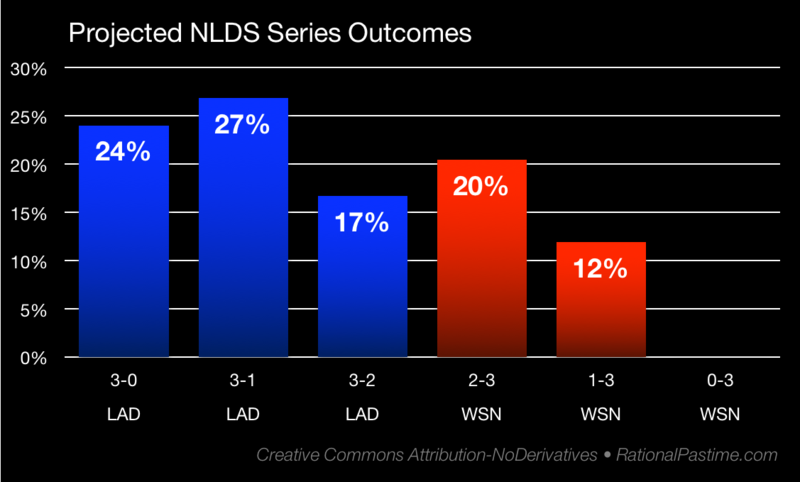 With all four National League squads in action today, check back soon to see how the results of the second games of the NLDS affect their chances of postseason glory.